So, there are a lot of dystopian YA novels out there, and a whole new crop of them this fall. In fact, there were so many I had to update my If you liked The Hunger Games flowchart (and I still feel like I’m leaving some out). Despite the seemingly endless supply of novels about a teen challenging the authority of their seemingly perfect yet obviously malicious society, none are quite like Crewel by Gennifer Albin. The concept behind Crewel is fascinating. I loved the passages where Adelice is weaving time and learning about how Spinsters create and control life in Arras. It’s kind of like the mythology of the Fates crossed with the mythology of The Matrix. Though I personally wish there would have been more of a sci-fi component, it worked as the basis for this fantasy world. Adelice is a likeable character. She’s snarky, and her sarcastic dialogue was delightful. I like a heroine with sass, and Adelice certainly delivered. Her ability to see the strands of time and matter, to pull them apart and stitch them back together, could have made her haughty or self-important, but she remains down-to-earth and loyal to those she cares about even when she’s being tempted with an extravagant life of pretty dresses and fancy parties that is what most girls in Arras dream of having one day. While it was awfully convenient that these two young men happen to be available to help Adelice once she’s been taken by the Guild, and doubly convenient that they both have feelings for her (though she only seems to have romantic feelings for one…) this “love triangle” didn’t immediately turn me off the way some do. The twist at the end (I’m trying not to spoil) made me want to find more about their pasts, which I already found compelling. In the tradition of The Handmaid’s Tale, Crewel had the potential to be read as a feminist text. While Spinsters, and particularly the Creweler, who is the only one who can gather the raw materials that Spinsters weave to make the world of Arras, are the ones with the power, they are controlled by the men of the Guild. Even women who don’t have the talent for weaving and live “normal” lives are only permitted to work in subservient service positions. Spinsters and regular citizens alike are objectified and forced to conform to a very sexualized vision of femininity. Throw in some illicit lesbian relationships, and you’ve got the perfect set up for a critique of patriarchy…but Crewel just didn’t pack enough of a punch to meet my feminist expectations. Of course, there are always those sequels. 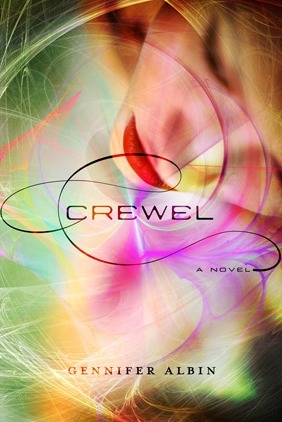 Despite being less than perfect, Crewel is a stand-out addition to the young adult dystopian romances that are still all the rage with the patrons at my library. It’s a highly readable, inventive, and well-written novel that I anticipate will be a hit, especially with fans of Delirium and The Selection. It’s certainly the most creative and unique dystopian world I’ve come across this year. Note: I received an advanced reader’s copy from the publisher. I haven’t read The Age of Miracles but have read reviews and know some teens who read and liked it. I can’t speak as to why it is adult, but I have read (and loved Curtis Sittenfeld is a favorite of mine) Prep. Though the narrator is in high school, it’s written with much more distance than a typical YA. Much more nostalgic than immediate. The themes are much deeper and more nuanced than typical YA. It definitely has crossover appeal, and possibly another publisher would have marketed it as upper/literary YA, but like similar titles (Laura Moriarty’s The Center of Everything comes to mind) even though it’s about teens, it’s more adult. I may just have to write a full post about it! I think I shall be adding this to my reading list. It sounds intriguing. It’s a concept I haven’t seen any other place and definitely worth checking out!